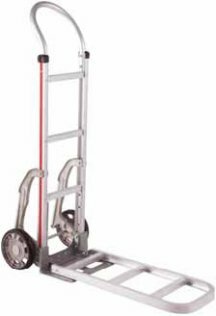 Straight back frame to provide structure & support to the hand truck. Two straight and one (bottom) curved back, bolted frame - case and keg. Curved back, bolted frame with molded cross members - barrels & kegs. Straight back, bolted frame with molded cross members. Curved lattice back frame for carrying round or flat loads. Straight lattice back for general use & transporting smaller packages. Basic loop handle with "U" brace for extra load support. Straight loop with cross brace and welded pin handle. Available in 52". Straight loop with cross brace and welded pin handle. Available in 55". Straight loop with cross brace and welded pin handle. Available in 60". 52" vertical loop handle for use with 1, 2, 4, 6, B and C frames. 60" vertical loop handle for use with 1, 2, 4, 6, B and C frames. Standard double pistol grip handle. Handles are comfortably curved out to meet the operator's hands and provide two-handed control. Straight loop handle with welded pistol grip on top for easier leverage. Slightly angles "U" loop handle (3" higher than #11 handle). "U" loop handle with vinyl sleeve for a comfortable grip and reduced user fatigue. "U" loop handle with vinyl sleeve and "U" brace for higher loads. Loop handle with straight top surface. 52" double vertical loop provides the operator a comfortable grip in various positions. 55" double vertical loop provides the operator a comfortable grip in various positions. 60" double vertical loop provides the operator a comfortable grip in various positions. 52" welded double grip handle is angled out to meet the operator's hands. 55" bolted dual grip increases control and offers multiple hand positions. 62" bolted dual grip increases control and offers multiple hand positions. BBolted dual grip handle with vertical post is 62" high and aids in the movement of tall loads.olted dual grip handle with vertical post is 62" high and aids in the movement of tall loads. Die-cast magnesium with recessed heel is 14" wide x 7 1/2" deep. Die-cast magnesium with recessed heel is 14" wide x 12" deep. Die-cast magnesium with recessed heel is 18" wide x 7 1/2" deep. Extruded aluminum 14" wide available with recessed heel 7 1/2" deep or flush mount 9" deep. Extruded aluminum 14" wide x 9" deep (flush mount only). Extruded aluminum 18" wide available with recessed heel 7 1/2" deep or flush mount 9" deep. Extruded aluminum 18" wide x 9" deep (flush mount only). Extruded aluminum 16" wide x 12" deep; 4" high (flush mount only). Extruded aluminum 20" wide x 12" deep; 4 1/2" high (flush mount only). High-strength steel 14" wide available with recessed heel 7 1/2" deep or flush mount 9" deep. High-strength steel 14" wide x 9" deep (flush mount only). High-strength steel 18" wide available with recessed heel 7 1/2" deep or flush mount 9" deep. High-strength steel 18" wide x 9" deep (flush mount only). 8" mold-on rubber on die-cast magnesium hub with double-groove ball bearings. Hard, puncture resistant rubber works well on smooth to semi-smooth surfaces. 8" or 10" solid, puncture resistant rubber tire on one-piece polyolefin hub with double-groove ball bearings. Strong, one-piece polyolefin hub with 8" or 10" puncture-resistant, shock absorbing, non-marking balloon cushion tires and double-groove ball bearings. 10" puncture-resistant microcellular foam tire with sealed semi-precision ball bearings - never goes flat and performs like a pneumatic tire but doesn't require air! 24" length x 12" wide low-profile formed plate extension. 20" length x 12" wide extruded aluminum channel extension. 30" length x 12" wide extruded aluminum channel extension. 22" long x 9" wide tubular aluminum; requires special frame.